Every issue of the Afrique, brings you information and updates from Africa. Starting from the latest happenings in the political world, the entertainment industry, to the world of education, this magazine covers it all. Buy a single copy or subscription to AM Afrique magazine. 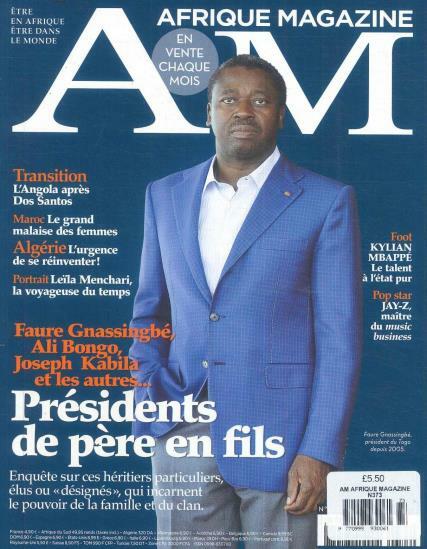 Afrique is a magazine, dedicated to the Africans living in France and other countries of Europe. This magazine is the ideal piece of read for every African living outside the country. It gets the latest news, information and updates from the African continent to people all across the globe. It reaches out to all the native Africans and caters to their needs perfectly, giving them just what they want. Every issue of the Afrique, brings you information and updates from Africa. Starting from the latest happenings in the political world, the entertainment industry, to the world of education, this magazine covers it all. It beautifully blends in the culture and modern lifestyle of the Africans, holding on to the traditional customs of the country. Afrique also covers all the aspects of the business world, catering to every individual and their needs.